Getting into Chile from Peru was a lot easier than entering Peru from Ecuador. It is a barren desert are with no sign of flooded rivers. 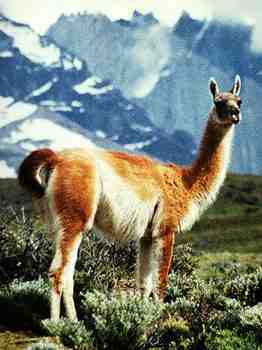 We continued down into Chile to go skiing but the mountainous areas we were in didn’t have any llamas. The photos on this page were taken on a separate trip in 1992. 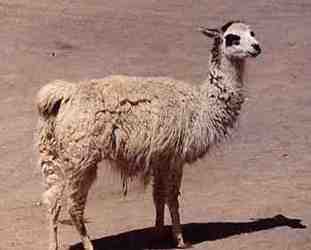 There are photos of the four species of lama: alpacas, guanacos, llamas, and vicuñas. 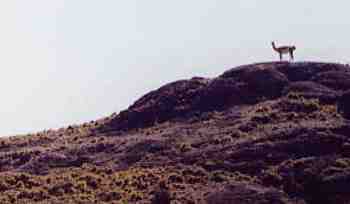 Arica is the most northern city in Chile and if you go east up into the mountains from there you might be lucky enough to see some vicuñas on the way up to Lauca National Park. 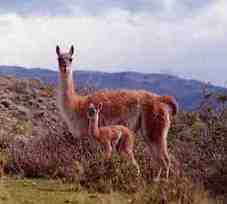 The vicuñas are pretty skitterish and will disappear into the distance at the slightest inkling of danger. 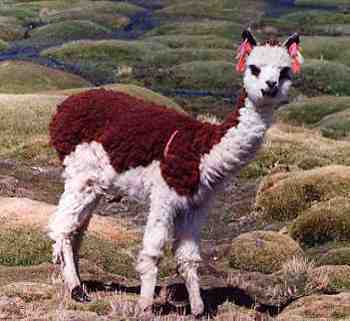 When you get to around the 14,000 foot level, the scenery is amazing and there are herds of llamas and alpacas grazing. Wherever there is water, there is are usually some animals grazing nearby as there is not much growing in the dry areas of the altiplano. 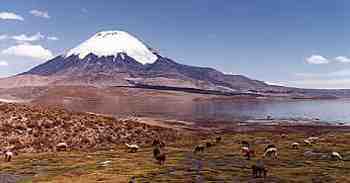 The volcano in the background is called Parinacota. 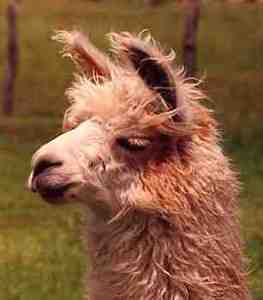 The animals are identified by tags of wool in their ears. Each owner has a different pattern of colours. 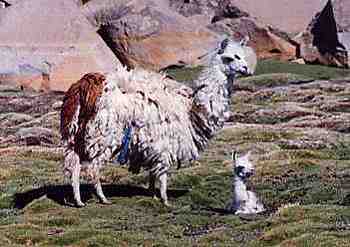 The shagging looking llama on the right has her new cria resting by her. 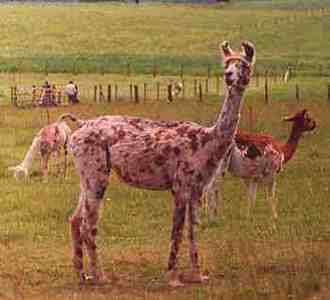 The llama on the left is not exactly in an area with great grazing, while the alpaca on the right has some fairly decent pasture. 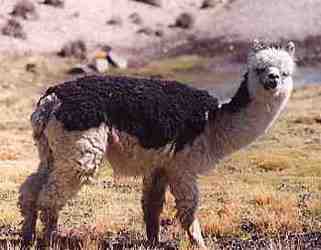 with bright colours of wool on their sides, as is the alpaca on the left. 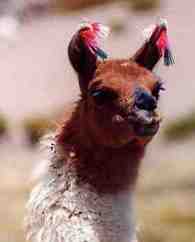 The alpaca on the right has a bell made from a tin can. I visited a llama farm near Temuco, which is a small city in the southern part of Chile, between Santiago and Puerto Montt. 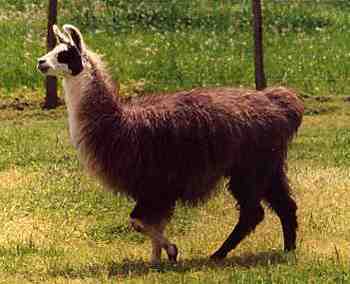 They had gone up in the mountains of the northern parts of Chile and selected the best llamas that they could find and had a large herd who obviously were doing well with all the lush grass in that area. 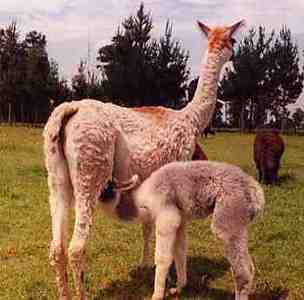 They had shorn many of their llamas as you can see by the mom with the fuzzy cria on the left. They young fellow on the right was too young to be shorn. They had every colour and pattern that you could imagine. Many miles south of Temuco, near the very tip of South America is Torres del Paine National Park. In this magnificent park the guancos are protected and there is a fair-sized herd there now after nearly being hunted to extinction by the sheep farmers. This male guanaco is a short distance away from his small harem of females and is very alert, always on the watch for the pumas who like to make meals of the guancos. 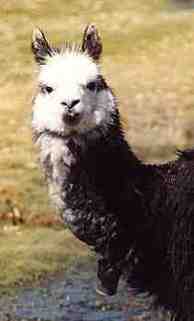 If he spots any danger, he will issue an alarm call that will be repeated by every male guanaco in hearing distance. The guanco on the left has a brand new baby with her. 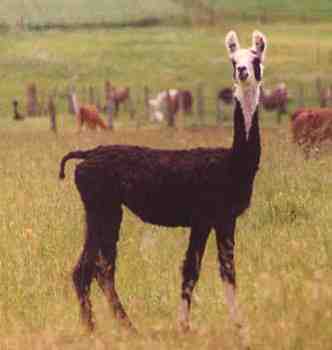 The babies are called chulengos. for danger in every direction.